“Hmm, we can reuse this.” The Colosseum. Image: Getty. In any debate on new construction in our urban centres you are likely to hear phrases like sustainable urban planning, adaptive reuse and recycling heritage – so much so that anyone would be forgiven for thinking that these were modern concerns. However, these principles have a long history in the ancient world. Anywhere permanent materials such as marble and granite were used to build monuments and infrastructure, recycling and reuse followed. The ancient Roman world is littered with examples of architectural recycling. Under the banner spolia studies, archaeologists and art historians have increasingly focused attention on the hows and whys of reuse in antiquity. Ancient architectural recycling falls into two broad categories: adaptive reuse of immovable structures, when a building or monument is renovated and its primary function changes; and reuse of architectural elements, where both functional and decorative material is removed from one building to be incorporated in another (spolia). While this is often associated with changes in ideologies, there is also evidence of opportunistic recycling following disasters. These events created a surplus of materials that could be salvaged for new constructions. In the hearts of Rome and Istanbul, the capitals of the ancient Roman and Byzantine empires, stand the Pantheon and Hagia Sophia. These iconic and celebrated public buildings were adapted for different religious purposes throughout history. Both maintained their heritage aesthetic, while renovating their function. The Pantheon was adapted from a pagan temple to a consecrated church in 609CE. The exterior Pantheon was largely unchanged, while the interior was stripped of its pagan elements. Hagia Sophia was adapted from a Christian basilica to an Islamic mosque following the fall of Constantinople to the Ottomans. The exterior required only the addition of minarets. The interior was whitewashed to cover the rich mosaics of its previous life. Civic buildings, too, were prime candidates for adaptive reuse, thanks to the rich materials and design of their original constructions. The restored Library of Celsus, Ephesus, with excavated ancient water pipes in the foreground. Image: author provided. At the newly listed UNESCO World Heritage site of Ephesus, the tourists’ visit culminates at the impressive multistorey Library of Celsus. Originally built in the second century, an earthquake and fire destroyed the library and its holdings in 262CE. The impressive facade of the library was salvaged and adapted 100 years later into a nymphaeum, a public water fountain. The adaptive process incorporated other recycled materials from nearby public monuments, mostly marble blocks and free-standing sculpture, fitting the change in function. This reuse gave the non-functional, but already historic, structure a new life. The Arch of Constantine is possibly the most referenced structure in spolia studies. Dedicated in 315, the arch celebrates Constantine’s victory over his rival Emperor Maxentius at the Battle of Milvian Bridge. The Arch of Constantine, where recycling even serves the purpose of propaganda. Image: Steve Kershaw/creative commons. First noticed by Raphael, the arch was built from a mixture of new and recycled decorative building material. Scenes of animal hunts, religious sacrifice and historic battles were taken from monuments built in the second century CE, including those of the emperors Hadrian, Trajan and Marcus Aurelius. These scenes represented the “golden years” of Rome’s past. Constantine didn’t just simply recycle these pieces; he reworked the stone faces of Rome’s greatest emperors into his own image. With this act, the emperor takes on all the great qualities of his predecessors and sets himself up as the rightful leader of Rome. This recycling takes us into a world of political propaganda, something the Romans were renowned for. This bold inclusion of old material in a new monument for Rome led to a whole new recycling trend in architecture. Decorative elements such as columns, capitals and architraves were given new life in buildings of the fourth century CE. The trend became so popular that new laws were created to protect public buildings from being stripped of their decoration. Only if a building could not be restored was it permitted to recycle that building’s materials. Natural disasters and invading armies often left ancient monuments in ruin. These created a stock of marble, granite and sandstone that could be reused in new constructions. The theatre at Nea Paphos, the scene of archaeological excavations since 1995. Image: Paphos Theatre Archaeological Project, University of Sydney/author provided. 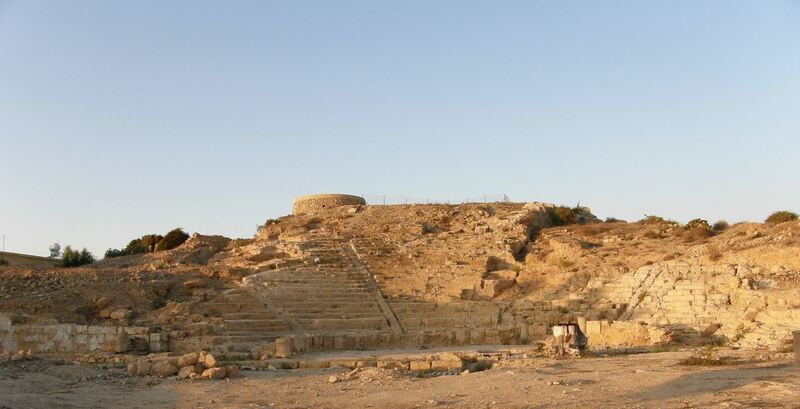 In Nea Paphos, Cyprus, a devastating earthquake destroyed the 8,500-seat theatre in 365CE. Instead of being rebuilt, the theatre became a useful source of marble and stone. Many of the columns and decorative architecture were carried off to be reused in the new Chrysopolitissa basilica, 300 metres down the road. In Athens, a late Roman fortification wall is a hodgepodge of recycled materials. Image: F. Tronchin/Flickr/creative commons. In Athens, the invading Heruli destroyed several public buildings in 267-8 CE. However, this left behind a good supply of reusable materials. The Athenians recycled many elements, from column drums to relief sculpture, in a large fortification wall circling the heart of the city. Today, the wall appears as a hodgepodge of recycled elements from Athens’ classical past. Historic buildings give us a glimpse of our past and lend character to our communities as well as serving practical purposes now. In 2011, the renamed department released a guide to help realise new recycling opportunities related to construction and demolition. These principles are part of our general thinking about urban planning. However, it is clear that this is not a new approach to sustainable urban development. Rather, it continues an ancient tradition of recycling. Candace Richards is acting senior curator at the Nicholson Museum, University of Sydney.